On September 7, 1957, President Dwight D. Eisenhower was vacationing at his summer home in Newport, Rhode Island, when his immediate presence was needed at the White House. Col. Virgil D. Olson of Marine Helicopter Squadron ONE (HMX-1) and his crew were ordered to fly the President in their HUS-1 across Narragansett Bay to the waiting Air Force One. HMX-1 continued to fly the President in the HUS-1 until it was replaced by the VH-3A Sea King in 1962. This aircraft is on loan from the National Museum of the Marine Corps. The many missions of the HUS-1 with the U.S. Marine Corps included personnel transport, combat assault, search and rescue, medical evacuation, and cargo transport. It also gained national fame as the recovery helicopter for the early Mercury space flights. The Sikorsky HUS-1 was developed as a lengthened and more powerful version of the HRS-3 (UH-19) Chickasaw. It first flew in 1954 as a U.S. Navy anti-submarine warfare helicopter. 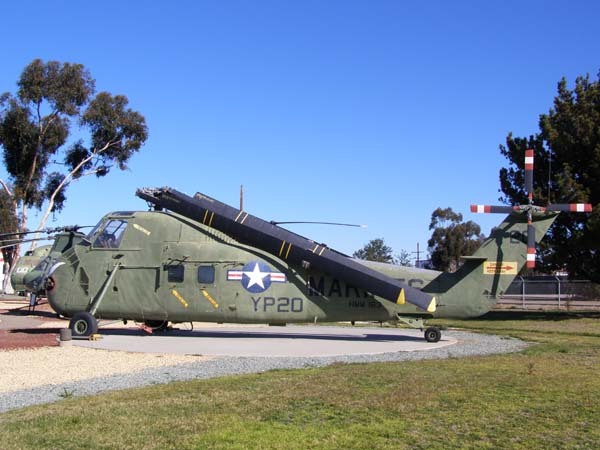 The Marine Corps received its first HUS-1 in 1957 as a replacement for the HR2S (H-37 Mojave) heavy lift helicopter. In 1962 it was redesignated as the UH-34D. 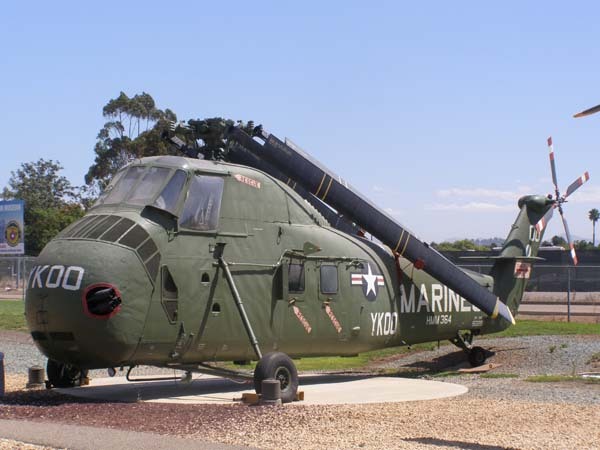 It served as the Marine Corps’ main operating helicopter in the Vietnam War until it was replaced in 1965 by the turbine-powered CH-46 Sea Knight. Outside the war zone, the UH-34 served in search and rescue missions, and utility and VIP transport. The last flight of a Marine UH-34 took place on September 3, 1973, marking the end of the USMC piston-engined helicopter era. Marine Corps UH-34s were also among the first gunship helicopters to be tested in combat, being fitted with a Temporary Kit-1 (TK-1), comprised of two M60C machine guns and two 19 shot 2.75 inch rocket pods. The operations were met with mixed enthusiasm, and the armed H-34s, known as &quot;Stingers&quot; were quickly phased out. The TK-1 kit would later form the basis of the TK-2 kit used on the UH-1E &quot;Huey&quot; helicopters of the USMC. Accommodations: Two crew and 12 combat troops or 8 litters or 2,000 lb of cargo. Power Plant: One 700-hp Wright R-1300- 3 seven-cylinder radial piston engine.